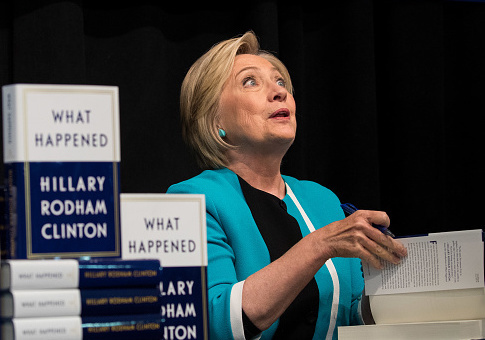 Almost no commentator, no reviewer, has mentioned the most newsworthy fact about Hillary Clinton's latest memoir—which is the near total lack of anything actually newsworthy in the book. With What Happened, Clinton would at last "let down her hair," Simon & Schuster's publicists loudly proclaimed before the book's publication. And that was the line dutifully repeated by reporter after reporter, as though it were a fact. As though, coming from Clinton's people, it didn't need to be checked or reported with even the slight distancing of "Hillary Clinton says she's let down her hair in her new book." But then, there's a kind of fittingness in that hair cliché, for Clinton probably does believe she has exposed her real self, set forth the true inwardness of her feelings. She's let it all hang out. She's made it real. She's taken her hair down to talk to us, person to person. And with her belief in all that, she comes closest to revealing in the memoir what actually happened. Hillary Clinton lost in good part because she speaks and thinks, she moves and has her being, in a world of clichés. So, for example, in What Happened she complains with unrelenting bitterness that she did too address the concerns of the Rust Belt. She did too speak directly to the damaged blue-collar class. She did too appeal to the white voters who did not support her. It's not her fault that they didn't believe her. It's not her fault that, if they even heard her, they suspected her heart wasn't in the message. She had her well-disciplined talking points like ducks in a row. If the ducks proved dead—that's not her fault. Has there been a more self-conscious major-party presidential candidate since Richard Nixon? The stiff way she moved, the personalizing of every slight, the grimacing smile as though she had been forced to teach herself how to wear her face: Nearly everything about Hillary Clinton spoke of a self-consciousness so vast, so heavy, that only the sternest will could shoulder it. Like a robot with slow actuators, she always seemed to have a gap between a stimulus and her response—a brief but noticeable moment of deciding how to react. Leave aside questions of her truthfulness about everything from her Rose Hill law firm's files to her private email server while she was at the State Department. Trump's needling epithet of "Crooked Hillary" gained traction because, regardless of her actual honesty, she had the affect of dishonesty—the pause that recalls for many viewers a liar choosing what to say. At the same time, has there ever been a less self-reflective major-party presidential candidate? Richard Nixon was at least very smart, and from his 1978 Memoirs through his late books on foreign policy, he proved capable of a good deal of self-abstraction and intellectual acumen. Neither saved him from paranoia and a thin-skinnedness unrivaled by any other elected president, but by the end he could nonetheless distance himself from himself a little. Hillary Clinton can't seem to distance herself at all. However uncomfortable she is in her own skin, she's locked inside that skin, and all her attempts at self-reflection, self-criticism, and self-awareness prove little more than clichéd repetitions of the kinds of things people are supposed to say when engaging in those activities. Her expressions of her interior life in What Happened seem just as robotic, just as programmed, as her expressions of an exterior life. And so she writes, "I've made mistakes, been defensive about them, stubbornly resisted apologizing," only to add, "but so have most men in politics (in fact, one of them just became president)"—deaf to the grating noise of her grievance trying to fit itself beside the insincerely borrowed language of a mea culpa. She speaks of loving hot sauce, only to add, "I've been a fan since 1992, when I became convinced it boosted my immune system, as research now shows it does"—unable to hear how the attempt to say she loves something is undone by that wooden "as research now shows it does." Some tiredness has shown in the mainstream response to the book. Jon Kass wrote in the Chicago Tribune, "Hillary: How can we miss you when you won't go away?" In the New York Times, Susan Chira echoed the point, calling her "the woman who won't go away." Even David Remnick's recent hagiographical account in the New Yorker has a slight undercurrent of dismissal. Back in April, Bill Maher set the tone when he compared her to first baseman Bill Buckner losing the Red Sox a winnable World Series by letting an easy grounder slip between his legs. What Happened might have been Clinton's way back from the woods to at least the status of elder stateswoman in the Democratic party, if it were better written. Some of the book is deadly dull. One chapter reads as though she were handed a staff-directory and told to say something about each worker at campaign headquarters. But most of the book is just plain dull. She doesn't like Bernie Sanders, and she thinks he established the lines of attack that the Republicans would use against her. That's probably true, but how is it news? She really doesn't like Donald Trump, and she thinks that he pandered to the lowest common-denominator of America: "I was running a traditional presidential campaign … while Trump was running a reality TV show." Again, that may well be true, but after the billions of dollars spent during the last election—much of it by Clinton herself—why do we need What Happened to tell us so? For that matter, wasn't it her husband who broke the traditional campaign she now mourns? Bill Clinton played the saxophone on late-night TV shows. He answered questions about his underwear. He triangulated every position down to the vanishing point. He ran a perpetual war room that smashed the incumbent Republican president's more old-fashioned campaign. It's a little late in the day for Hillary Clinton to bemoan the election of a man who carried some of her husband's campaign techniques to their logical extreme. A sad endlessness suffuses the list of all those Clinton blames for her loss. The nation just wasn't ready for her. Fake news undid her. The New York Times was mean to her. James Comey and the FBI were out to get her. So were Vladimir Putin and Julian Assange. Misogyny and racism. Racism and misogyny. Misogyny again, just in case we missed it the first dozen times she mentions it. The FBI again, too. The election of 2016 was fated by a number of factors to be a bad year for the Democrats. And the situation was made worse when the party nominated Hillary Clinton, who seemed at the time to be a bad retail politician after losing the 2008 primaries to Barack Obama despite all her institutional advantages and nearly losing the 2016 primaries to a socialist. But then—oh, miraculous day!—the other party screwed up the primaries enough to nominate Donald Trump, the only visible Republican that the Democrats could be sure of beating. The fact that she went on to be defeated elevates her in a way that she cannot grasp with her strange combination of self-consciousness and unself-reflectiveness in What Happened. To lose to Donald Trump, with so much institutional weight behind her, raises her far beyond any other. This was not just a bad candidate. This was a terrible candidate—the worst campaigner ever to receive a nomination. Maybe the best way to look at her new memoir is that the book represents a determined, powerfully willful effort not to understand just how bad she was. This entry was posted in Culture and tagged 2016 Election, Book reviews, Hillary Clinton. Bookmark the permalink.